Millennial Media is out with another monthly report this morning showing the state of the mobile market for the month of October. The Android operating system, which has enjoyed steady growth for a significant period, holds steady as the most-used OS — a position it has held for the past 11 months — with 56 percent of the smartphone market, but its rise has flat-lined since September. 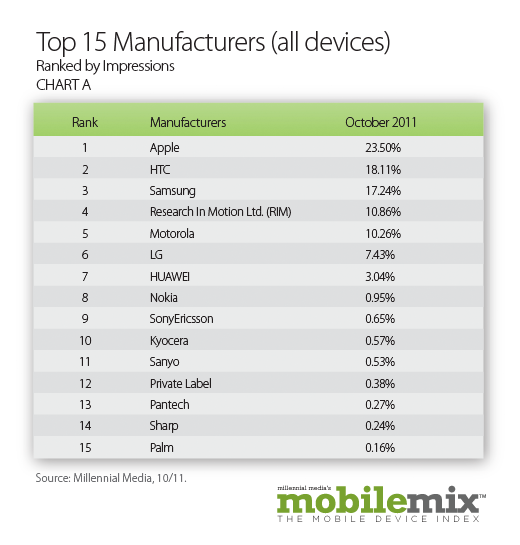 Apple’s iOS continues to occupy the second place spot, with 28 percent of ad impression share on Millennial’s network. Millennial attributes this to the growth of the iPad, which continues to be (not surprisingly) the most-used tablet. Research In Motion also held steady, coming in third with 13 percent of impression shares. 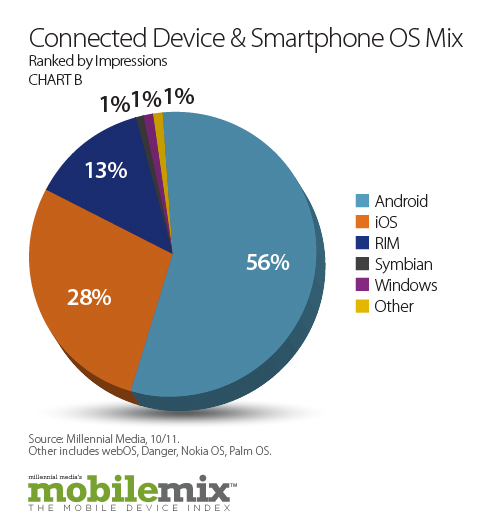 Each of the remaining mobile OS manufacturers — Nokia’s Symbian, Microsoft’s Windows Phone, and all other mobile OSs — hold onto a mere 1 percent of impression shares. Apple remains the top device manufacturer, with 24 percent of the mobile market. And the iPhone is the most-used device, with 13 percent of impressions appearing on that device. Samsung saw a notable boost of 7 percent, and now controls more than 17 percent of all mobile devices. This rise is due to increased sales of the Nexus S and Galaxy S, both of which have spots in Millennial’s list of Top 20 devices. Despite its jump in market share, Samsung still falls behind HTC, which has just over 18 percent market share in the mobile market. 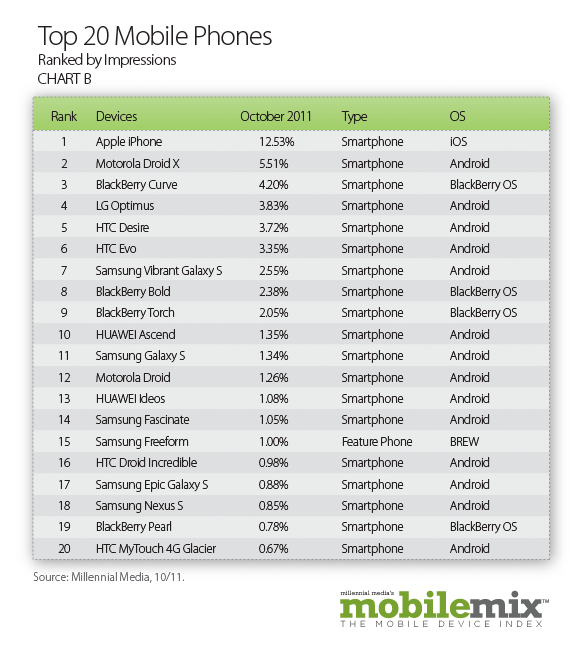 In total, Android devices account for 14 of the top 20 smartphones. 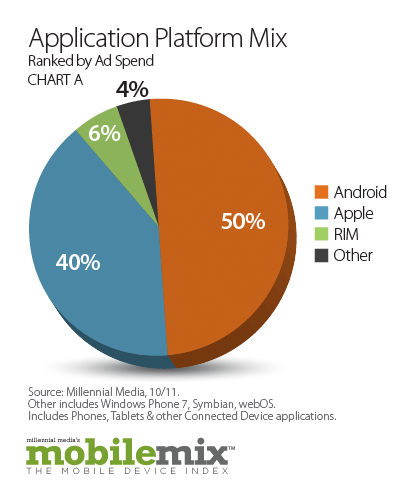 In the Application Platform Mix portion of Millennial’s report, Android took 50 percent, and Apple’s iOS took 40 percent. The Music & Entertainment app category jumped to the #1 slot, and games fell to #2, based on ad served. 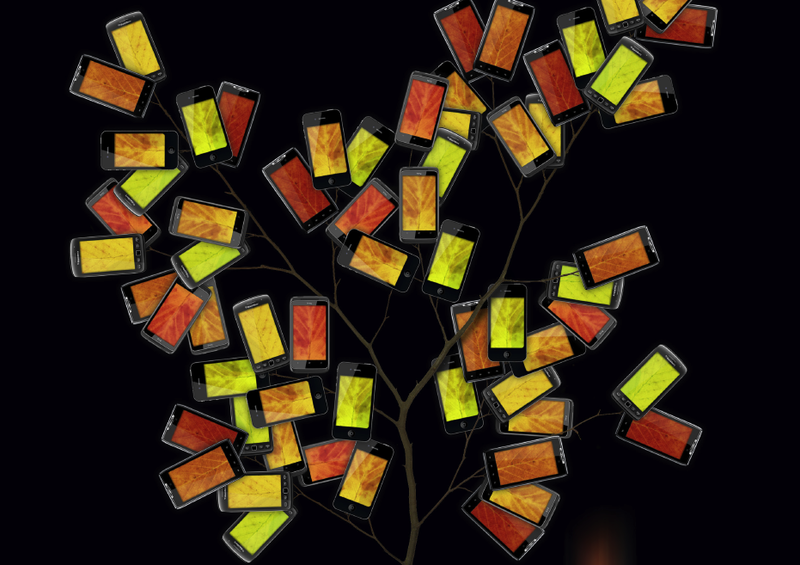 Communication apps, mobile social media apps and news apps took spots three through five. And Productivity & Tools apps grew 14 percent to take the #6 slot. Is the world ready for Romo, the smartphone robot?